Firstly apologies for being so inactive on my blog and for being so late in announcing my plans for 2013. However let me get this little project off the ground and then I can play catch up with you all. My plans for 2013 are to raise funds for mind, the UK Mental Health Charity. With this in mind (pun intended of course) I have set up a Just Giving Page. 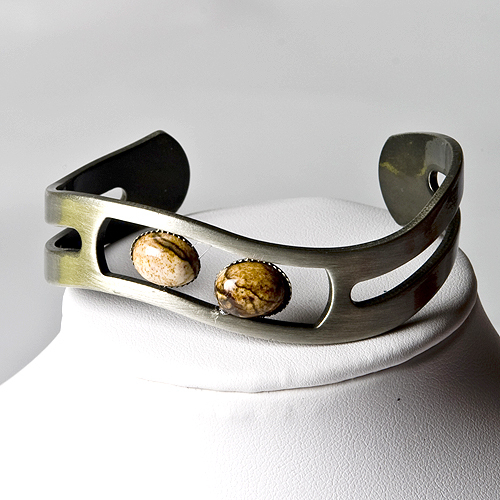 This is a burnished silver plated bangle with two Picture Jasper stones – I sold these at £10 and I feel a minimum donation of £5 would be appropriate. Postage and packaging will be £2 in the UK and £3 worldwide.